A Roommate Agreement is a legal contract made in a favorable manner between the residents of a rental unit with a lot of perfection. The Sample Agreements largely outline the strict terms and conditions plus responsibilities that are agreed wholeheartedly by each of the residents. It should be in the written form and signed by two or more parties involved in it. 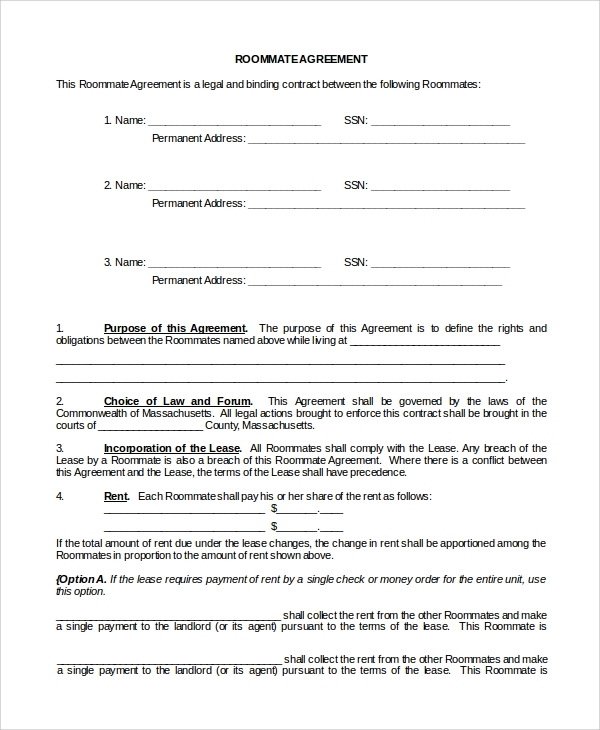 This Roommate Rental Agreement is signed by the co-tenants with the terms and conditions along with the responsibilities that will be shared. This agreement isn’t made orally. This particular Roommate Agreement is made in the written form. 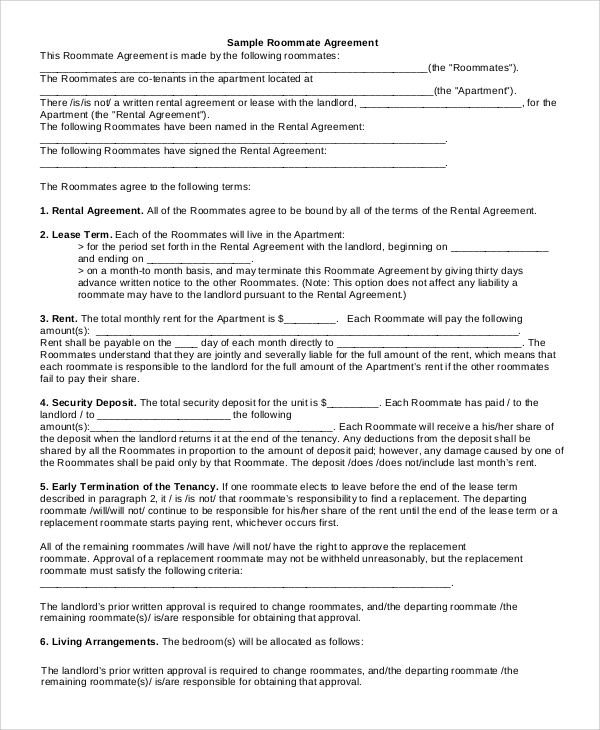 This Roommate Agreement Form comes with sufficient space to fill in details and information. 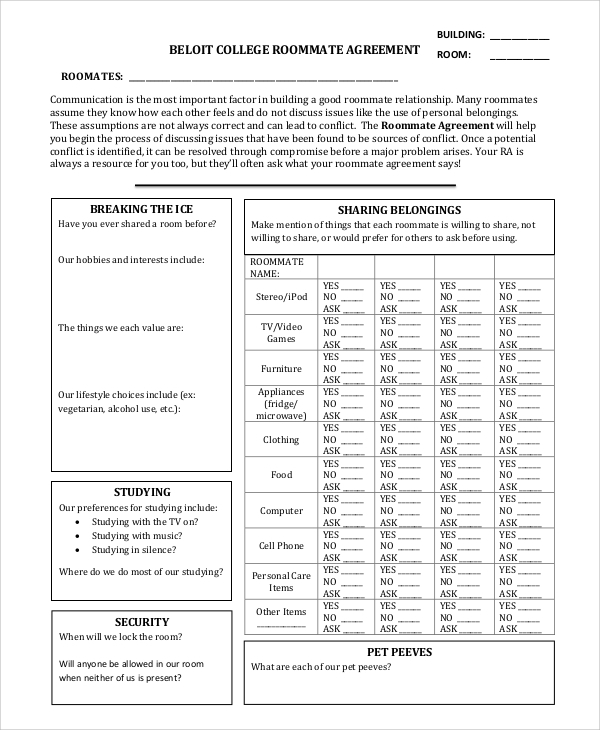 An apt template format and appropriate dialogues are used widely to make the agreement look legal and meaningful among the owner, tenants, and co-tenants. 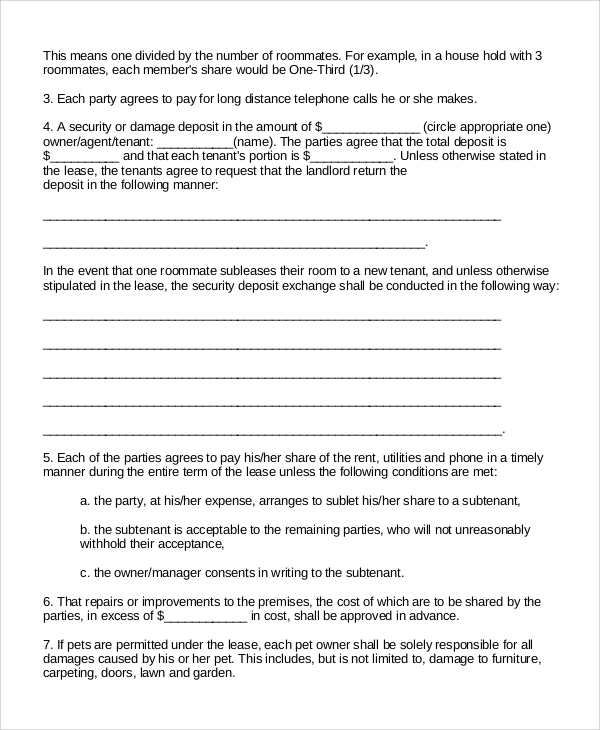 This Roommate Agreement Sample gives an idea of what all crucial points need to be included in the Roommate Agreement deals without fail by the concerned parties. The sample format and template must be strictly followed and necessary changes can be made as per the deal. 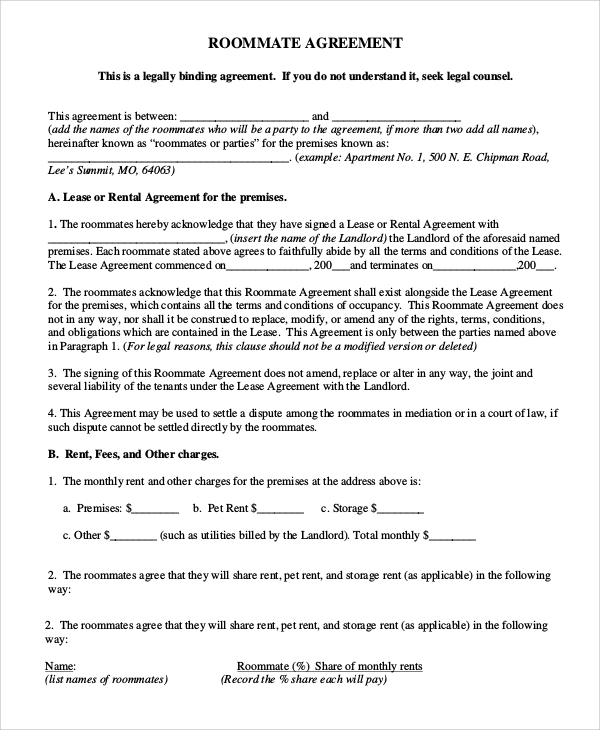 The Legal Roommate Agreement is an agreement made in a legal manner between the co-tenants of the residential unit. 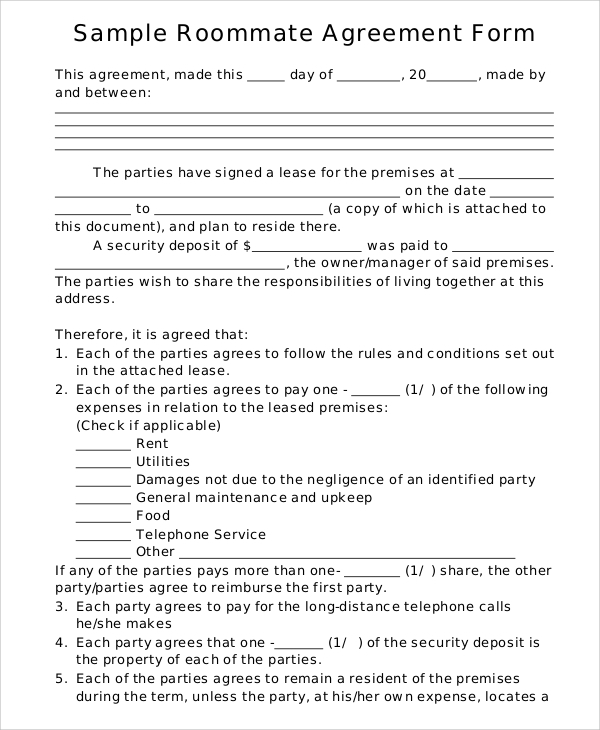 The co-tenants are advised to read and then sign this roommate agreement. They are suggested to personally check each and every point whether they agree with it or not. 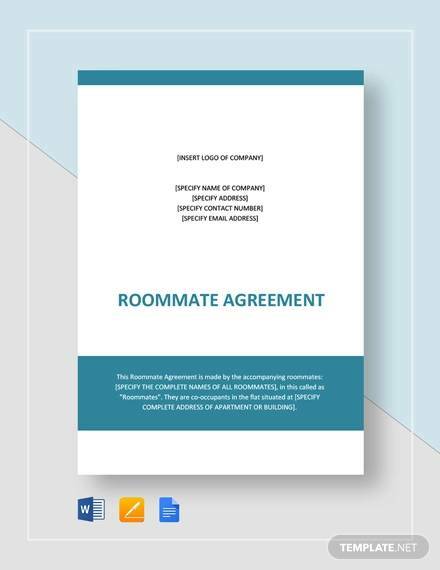 The College Roommate Agreement is a roommate agreement signed by the college mates when they share a residential unit with the knowledge of the owner of the residential unit. 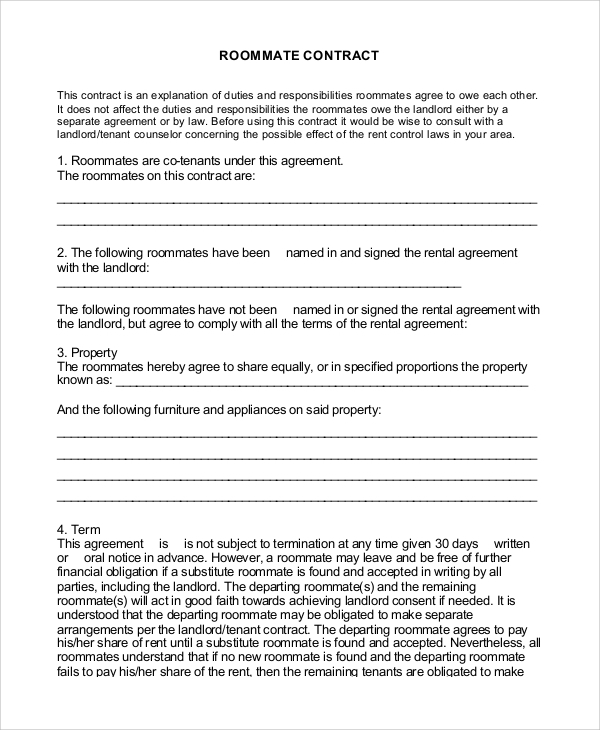 They have to agree to certain terms and conditions plus responsibilities that will be agreed upon by them related to the roommate agreement. How Should A Roommate Agreement Be Drafted? What Points Must Be Given Importance In A Roommate Agreement? The roommate agreement points that must be given importance are privacy, use of shared spaces, keys and lock holding and its maintenance. Also, matter related to entertaining opposite gender in the room, all rules and processes surrounding paying the bills related to a maidservant, electricity, cable, drinking water, food from outside plus rent and any rules and regulation about guests and noise level. On the other hand, rules and regulation concerning using each other’s belongings, how certain household chores will be rightly divided and rules related to inviting parents, relatives, and friends for stay for a short period. 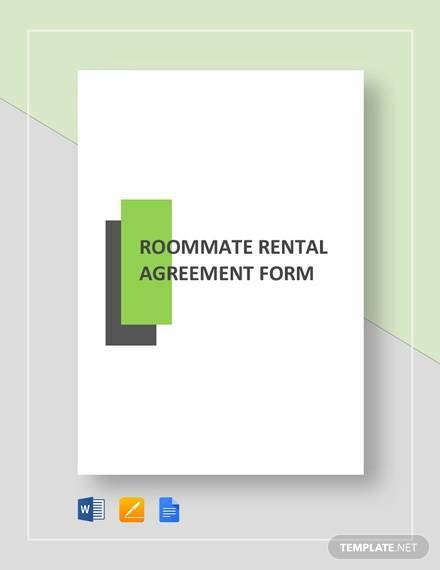 Roommate Agreement and the Rental Agreement Samples plays a significant role among co-tenants or roommates who are willing to share a residential unit that was rented or leased out by an owner or landlord. 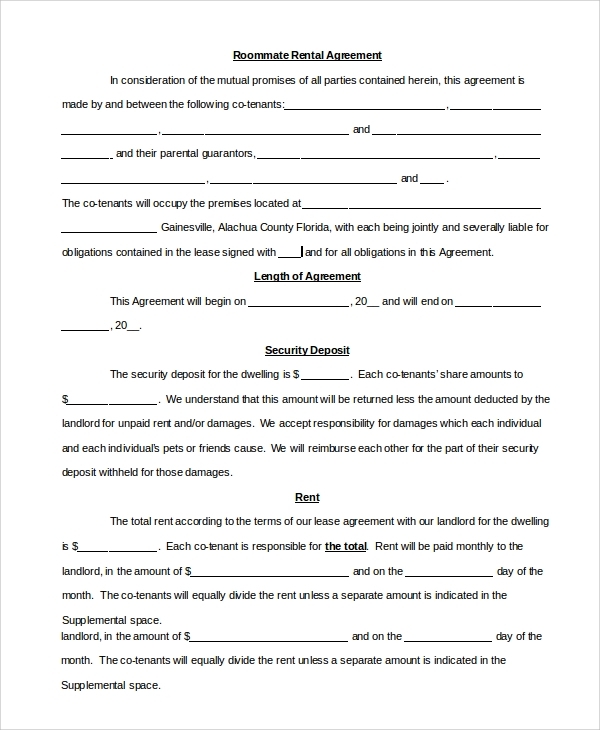 There is a need for two or more parties who are involved in the agreement to read the roommate agreement very carefully and then sign on the dotted lines.